Four Queens. A divided nation. A ruthless pickpocket. A noble messenger. And the murders that unite them. Keralie Corrington is a talented pickpocket. She steals for the black market in her quadrant. Her nation is divided into four regions, each strictly separated from the other.... read full description below. Four Queens. A divided nation. A ruthless pickpocket. A noble messenger. And the murders that unite them. Keralie Corrington is a talented pickpocket. She steals for the black market in her quadrant. Her nation is divided into four regions, each strictly separated from the other. Four queens, one from each quadrant, rule as one. When Keralie steals a particularly valuable item from a messenger, she discovers she's intercepted instructions to murder the queens. Hoping to find the culprit, Keralie teams up with Varin Bollt. But with Keralie and Varin each keeping secrets - and the lives of the queens hanging in the balance - everything is at stake. And no one can be trusted in a world full of ruthless thieves, black markets, a golden palace, daring heists, royal intrigue, noble messengers, forbidden love, four queens - each with a secret, and, of course, murder. 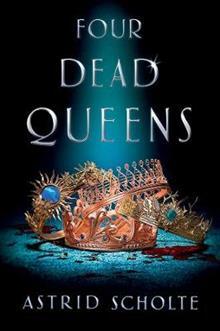 An enthralling fast-paced murder mystery where competing agendas collide with deadly consequences, Four Dead Queens heralds the arrival of an exciting new YA talent.